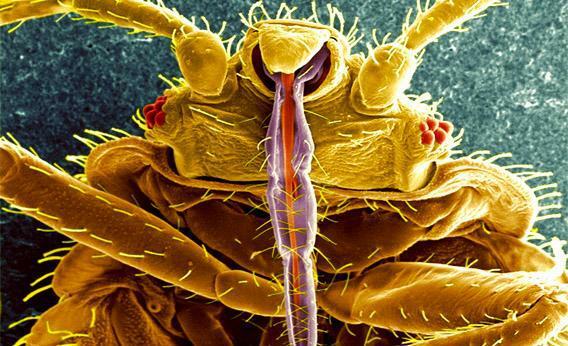 Parasites: The little bugs are everywhere, and they are our enemies. This digitally colorized micrograph shows the underside of a bedbug, Cimex lectularius. From this view you can see the insect’s skin-piercing mouthparts it uses to obtain its blood meal, as well as a number of its six-jointed legs. Parasites are all around us—humans alone have more than 100—yet they receive little attention. That should change, says ecologist Kevin Lafferty. We don’t know for sure, but we do know that parasitism is the most popular lifestyle on Earth. Most animal species are probably parasitic. For humans alone, there are more than 100 host-specific parasites. Among described species on the planet, the ratio of free-living to parasitic is about 60:40, but that’s a gross underestimate. In reality the numbers are probably much more in favor of the parasites. Almost all intellectual effort focused on parasites is directed at how we can kill and prevent them. That’s not the best way to get an insight into their ecological role. Early ecologists were well aware of parasites, but in more modern times, that aspect of thinking was dropped. There has been little training to look inside organisms. Fortunately that has changed in the last 10 years and we have seen an incredible surge of interest. Parasites are integral, basic components. The more intact the ecosystem, the more parasites you tend to find there. That can be shocking to people, who usually think parasites are a sign that a system is out of balance. In general, though, we tend to find lots of parasites in pristine places. But I don’t want to sound romantic about parasites and tell you they are great—I mean, they are our enemies. Anybody with parasites doesn’t harbor any warm feelings towards them. My first experience with a parasite was at summer camp when I had a tick on my testicle. It was emotionally scarring. All the kids looked on as a camp counselor burned the tick off with a match.